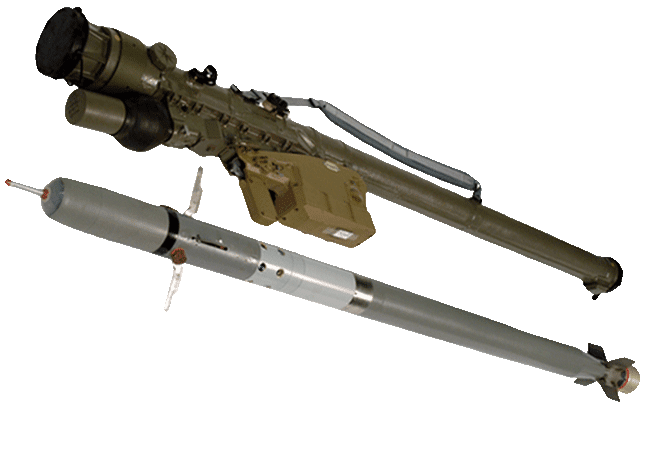 The FIM-92 Stinger is a Man-Portable Air-Defense System (MANPADS) that operates as an infrared homing surface-to-air missile (SAM). 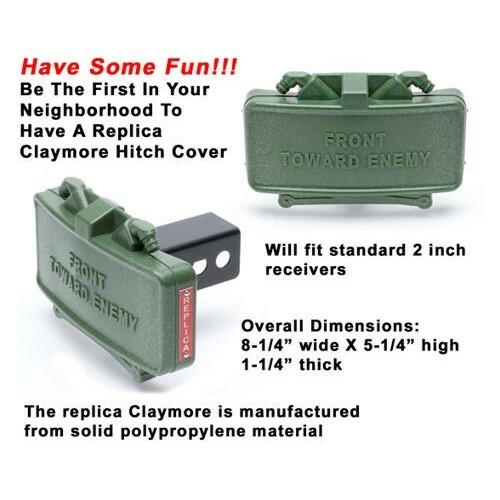 It can be adapted to fire from a wide variety of ground vehicles and helicopters. Developed in the United States this weapon system entered service in 1981 and is used by the militaries of the United States and 29 other countries. It is principally manufactured by Raytheon Missile Systems and is produced under license by EADS in Germany and by Roketsan in Turkey with 70,000 missiles produced. 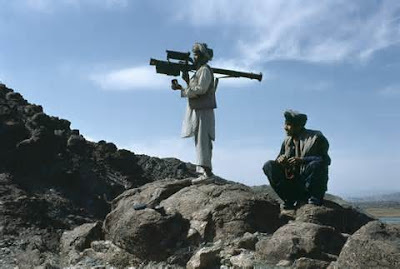 Light to carry and easy to operate, the FIM-92 Stinger is a passive surface-to-air missile, that can be shoulder-fired by a single operator (although standard military procedure calls for two operators, spotter and gunner). The FIM-92B missile can also be fired from the M-1097 Avenger and the M6 Linebacker. 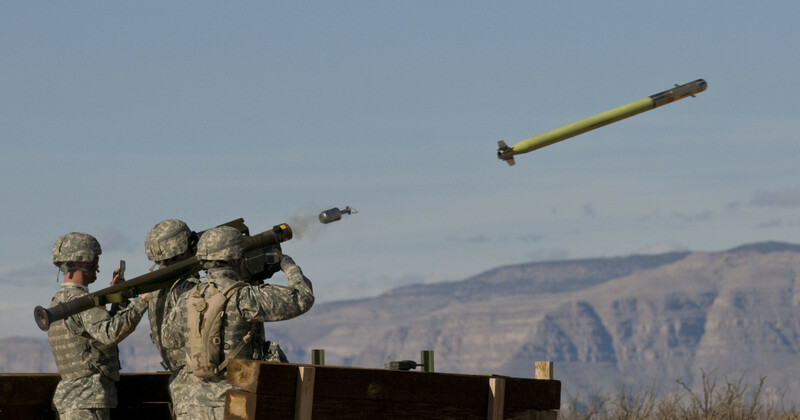 The missile is also capable of being deployed from a Humvee Stinger rack, and can be used by airborne troops. A helicopter launched version exists called Air-to-Air Stinger (ATAS). The missile is 5.0 ft long and 2.8 inches in diameter with 10 cm fins. The missile itself weighs 22 lbs, while the missile with launcher weighs approximately 34 lbs. 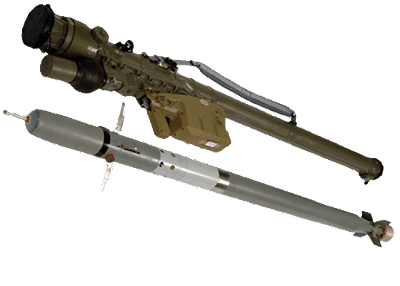 The Stinger is launched by a small ejection motor that pushes it a safe distance from the operator before engaging the main two-stage solid-fuel sustainer, which accelerates it to a maximum speed of Mach 2.54 (750 m/s). The warhead is a 3 kg penetrating hit-to-kill warhead type with an impact fuze and a self-destruct timer. To fire the missile, a BCU (Battery Coolant Unit) is inserted into the handguard. This shoots a stream of argon gas into the system, as well as a chemical energy charge that enables the acquisition indicators and missile to get power. The batteries are somewhat sensitive to abuse, with a limited amount of gas. Over time, and without proper maintenance, they can become unserviceable. The IFF system receives power from a rechargeable battery. Guidance to the target is initially through proportional navigation, then switches to another mode that directs the missile towards the target airframe instead of its exhaust plume. 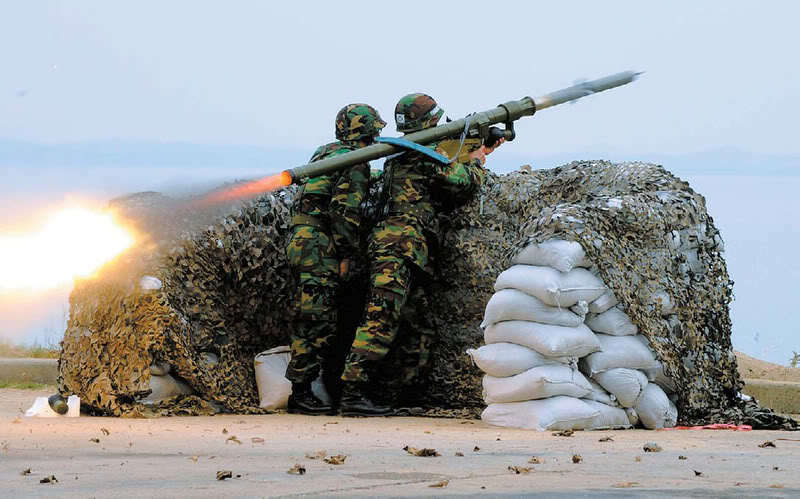 The 9K32 Strela-2 (NATO reporting name SA-7 Grail) is a man-portable, shoulder-fired, low-altitude surface-to-air missile system (MANPADS) with a high explosive warhead and passive infrared homing guidance. Broadly comparable in performance with the US Army FIM-43 Redeye, it was the first generation of Soviet man-portable SAMs, entering service in 1968, with series production starting in 1970. 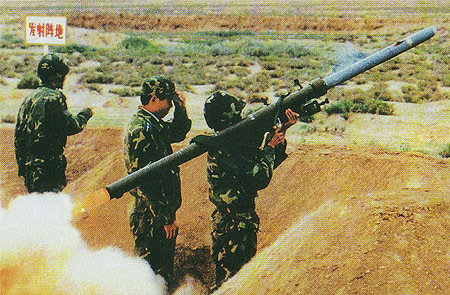 Described by one expert as being "the premier Russian export line",the Strela and its variants have seen widespread use in nearly every regional conflict since 1968. The missile launcher system consists of the green missile launch tube containing the missile, a grip stock and a cylindrical thermal battery. The launch tube is reloadable at depot, but missile rounds are delivered to fire units in their launch tubes. The device can be reloaded up to five times. The manufacturer lists reaction time measured from the carrying position (missile carried on a soldier's back with protective covers) to missile launch to be 13 seconds, a figure that is achievable but requires considerable training and skill in missile handling. 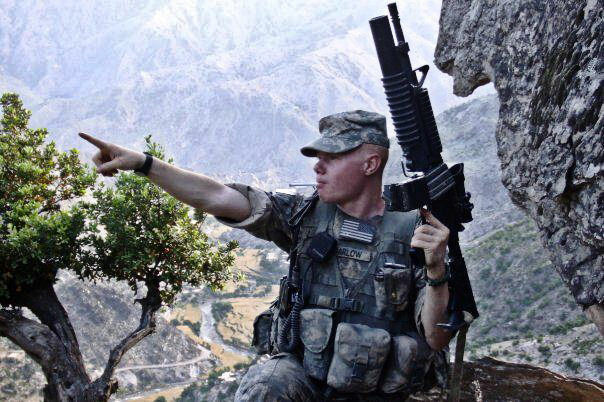 With the launcher on the shoulder, covers removed and sights extended, reaction time from fire command to launch reduces to 6–10 seconds, depending greatly on the target difficulty and the shooter's skill. After activating the power supply to the missile electronics, the gunner waits for electricity supply and gyros to stabilize, puts the sights on target and tracks it smoothly with the launch tube's iron sights, and pulls the trigger on the grip stock. This activates the seeker electronics and the missile attempts to lock onto the target. If the target is producing a strong enough signal and the angular tracking rate is within acceptable launch parameters, the missile alerts the gunner that the target is locked on by illuminating a light in the sight mechanism, and producing a constant buzzing noise. The operator then has 0.8 seconds to provide lead to the target while the missile's on-board power supply is activated and the throw-out motor ignited. Should the target be outside acceptable parameters, then the light cue in the sight and the buzzer signal tell the gunner to re-aim the missile. Once the missile is five and a half meters away from the gunner, c. 0.3 seconds after leaving the launch tube, it activates the rocket sustainer motor. The sustainer motor takes it to a velocity of 430 meters per second, and sustains it at this speed. Once it reaches peak speed, at a distance of around 120 meters from the gunner, the final safety mechanism is disabled and the missile is fully armed. All told, the booster burns for 0.5 second and the driving engine for another 2.0 seconds. The missile's uncooled lead sulphide passive infra-red seeker head detects infrared radiation at below 2.8 μm in wavelength. It has a 1.9 degree field of view and can track at 9 degrees per second. The seeker head tracks the target with an amplitude-modulated spinning reticle (spin-scan or AM tracking), which attempts to keep the seeker constantly pointed towards the target. The spinning reticle measures the amount of incoming infrared (IR) energy. It does this by using a circular pattern that has solid portions and slats that allow the IR energy to pass through to the seeker. As the reticle spins IR energy passes through the open portions of the reticle. Based on where the IR energy falls on the reticle the amount or amplitude of IR energy allowed through to the seeker increases the closer to the center of the reticle. Therefore, the seeker is able to identify where the center of the IR energy is. If the seeker detects a decrease in the amplitude of the IR energy it steers the missile back towards where the IR energy was the strongest. The seeker's design creates a dead-space in the middle of the reticle. The center mounted reticle has no detection capability. This means that as the seeker tracks a target as soon as the seeker is dead center, (aimed directly at the IR source) there is a decrease in the amplitude of IR energy. The seeker interprets this decrease as being off target so it changes direction. This causes the missile to move off target until another decrease in IR energy is detected and the process repeats itself. This gives the missile a very noticeable wobble in flight as the seeker bounces in and out from the dead-space. This wobble becomes more pronounced as the missile closes on the target as the IR energy fills a greater portion of the reticle. These continuous course corrections effectively bleed energy from the missile reducing its range and velocity. The guidance of the SA-7 follows proportional convergence logic, also known as angle rate tracking system or pro-logic. In this method, as the seeker tracks the target, the missile is turned towards where the seeker is turning towards – not where it is pointing at – relative to the missile's longitudinal axis. Against a target flying in a straight-line course at constant speed, the angle rate of seeker-to-body reduces to zero when the missile is in a straight-line flight path to intercept point. The 9K34 Strela-3 is a man-portable air defence missile system (MANPADS) developed in the Soviet Union as a response to the poor performance of the earlier 9K32 Strela 2 (SA-7 Grail) system. "9K34" is its GRAU designation, while its NATO reporting name is SA-14 Gremlin. The missile was largely based on the earlier Strela 2, and thus development proceeded rapidly. The new weapon was accepted to service in the Soviet Army in January 1974. The most significant change over the Strela 2 was the introduction of an all-new infra-red homing seeker head. The new seeker worked on FM modulation (con-scan) principle, which is less vulnerable to jamming and decoy flares than the earlier AM (spin-scan) seekers, which were easily fooled by flares and even the most primitive infrared jammers. The new seeker also introduced detector element cooling in the form of a pressurized nitrogen bottle attached to the launcher. The effect of cooling was to expand the seeker's lead sulphide detector element's sensitivity range to longer wavelengths (slightly over 4 µm as opposed to 2.8 µm of uncooled PbS elements). In practice this made possible the tracking of cooler targets over longer ranges, and enabled forward-hemisphere engagement of jets under favourable circumstances.The seeker also had better tracking rate, enabling the missile to track maneuvering of fast and approaching targets. A negative side effect from the aforementioned improvements was increased missile weight, which caused a slight decrease in the kinematic performance of the original Strela-2 (SA-7). Against relatively slow, low-altitude battlefield air threats the overall effectiveness was much improved. Strela-3 missiles have been exported to over 30 countries. The original Strela-3 missile was the 9M36.